All you have to do is turn on the TV to see that Koreans are obsessed with food and have high standards and loud opinions about the best way to cook or season a dish. International chefs have taken notice and started to take up shop in Seoul, adding to its already teeming and dynamic food scene. Now is the time to explore Seoul’s food, but forget barbecue and fried chicken–there’s so much more to discover in this sprawling, food—loving city. Mina Park is the founder of Sook, a project that breathes new life into Korean food traditions through workshops, collaborations and storytelling. This year, cult favourite Tartine Bakery of San Francisco chose Seoul for its first expansion outside of the U.S. and, in January, their first Seoul location in the quietly chic neighbourhood of Hannam-dong opened to endless queues. In the lofty Hannam-dong space, you’ll find Tartine classics such as their morning buns and country bread as well as locally-inspired items such as Jeju tangerine juice and the Hannam multigrain loaf made with Korean fermented rice wine, makgeolli. Recently, the new design-orientated Ryse Hotel in Hongdae opened with a Tartine Coffee Bar serving Coffee Manufactory beans and a Toast Bar featuring their oozing hot pressed sandwiches. With one or two more locations planned for Seoul this year alone, Tartine’s taking over the world—one avocado-topped slice of sourdough bread at a time. Pyongyang-style cold buckwheat noodles (naengmyeon) have a loyal and opinionated following amongst Korean food lovers. Ask where the best naengmyeon is served and a heated debate likely will ensue. Always included among the best though is Ojangdong Hamheung Naengmyeon, which has been satisfying noodle cravings since 1953. This place is no-frills; their décor may not have changed much since the '50s, and the elderly couple sitting next to you likely has been coming here for decades. The signature bowl of noodles is slathered in spicy red pepper paste with a splash of chilled beef broth and topped with chewy raw skate, cucumber, pickled daikon radish and a boiled egg—the time-honoured antidote to a sweltering Korean summer. When soju-fuelled nights start to lose their appeal, take refuge and restore your balance at the Tea Collective. Art director Mijae Kim has created a warm, sun-drenched oasis in the heart of Chungdam-dong featuring their own line of locally harvested teas and infusions made from Korean plants and fruits. The Tea Collective aims to bring together a community in search of more mindfulness in their urban lives. Have a mugwort (ssug) scone or a pumpkin glutinous rice cake along with your healing tea. And keep an eye out for their monthly studio talks featuring like-minded creatives from around the world or tea workshops. Jungshim in Itaewon is one of those hidden gems that you reluctantly share with other people because you’re worried you’ll never be able to get a seat there again. There are actually two Jungshims run by the same chef, Paul Lee, but the cosiest is the more casual location. The menu is handpainted on wooden boards lining the intimate interior, but ask the staff for their daily specials based on what’s in season. Jungshim is most well known for their kalguksu, or knife-cut noodles in seafood soup, which make a hearty and soul-satisfying lunch. But this is a wonderful place to spend an evening with friends over Hallasan soju from Jeju island and their battered bajirak clams, steamed pork belly or, really, anything that chef Lee brings out for you. Lauded as Korea’s best restaurant by the World’s 50 Best Restaurants and granted a Michelin star in 2017, Mingles in swanky Chungdam-dong lives up to the hype. Mingles manages to be both contemporary and worldly while also deeply respectful of Korean culinary traditions. 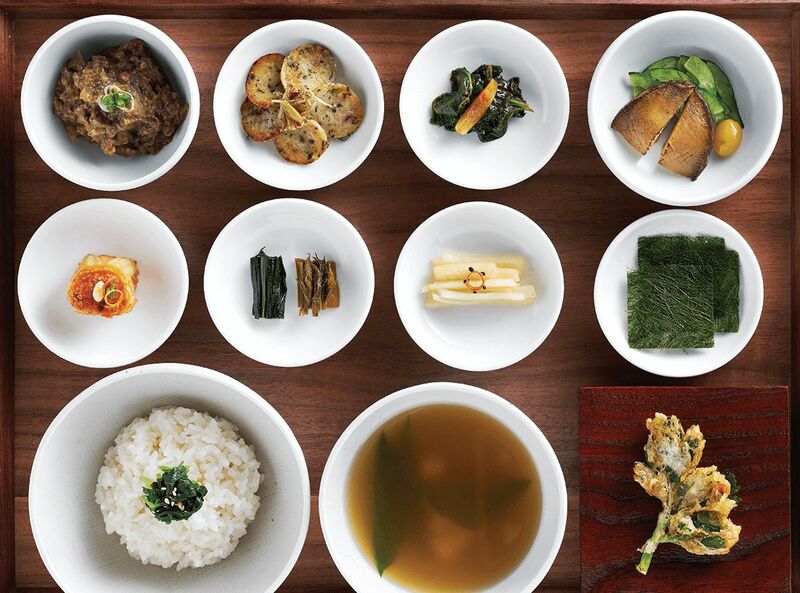 Chef Mingoo Kang celebrates native ingredients while in season, such as a tender carrot leaf that grows in the mountains in early spring on the island of Ulleungdo. His attention to detail and passion for the Korean terroir is evident in his version of the traditional Korean bansang, which can be included as part of a set menu. Chef Kang transforms the everyday meal set of rice, soup and side dishes (banchan) with his perfectly crisp seasonal pickles (jangajji), the airiest batter-fried veg (tuigim) and a bowl of soup made from traditionally fermented soybean paste. The bansang, like the entire Mingles experience, is immaculate yet soulful. While the tourists flock to Gwangjang market for bindaettuk (mungbean pancakes) and makgeolli, the chefs (and elderly pensioners) can be found at Gyeongdong Market near Dongdaemun. This traditional market is famous for its focus on traditional medicine stalls overflowing with dried roots and herbs to be brewed or powdered into healing potions. And, in the other winding alleys of the market, you will find farmer’s stalls with fresh seasonal produce such as every imaginable foraged mountain green during springtime, or vendors of freshly pressed sesame and perilla oils. Prices are exceedingly reasonable especially compared to conventional supermarkets and department store food halls, but don’t forget to bring cash.